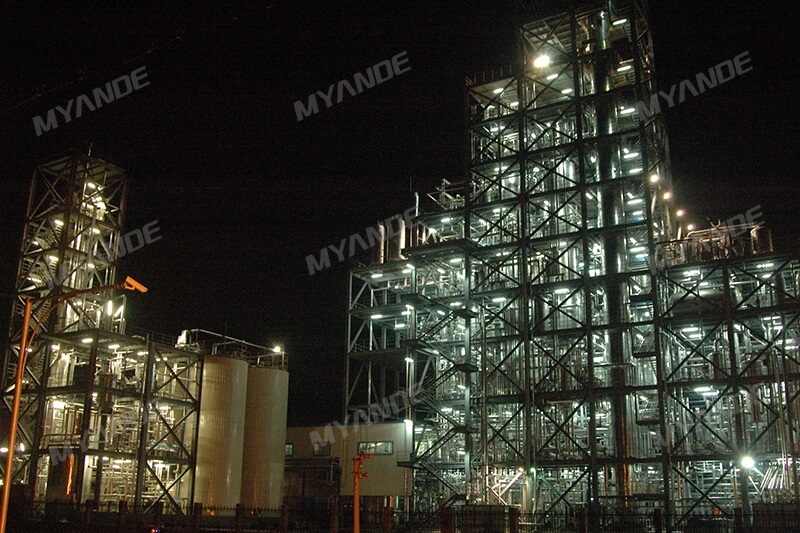 Provider of oleochemicals technology | Myande Group Co., Ltd.
Glycerine content of fat hydrolysis wastewater and manufacturing waste water reaches about 10-15%. Generally adopting methods of chemical decontamination, ion exchange and electrical purification. Based on the principle of evaporation, content of glycerine reaches 80-90%, to yield crude glycerin. Crude glycerine is distilled in distillation column to make refined glycerine, after decolorizing and bleaching to make finished products refined glycerin. Mixed vapour out of the top of distillation column is further separated into 2nd grade glycerine. Natural fatty acids can be extracted from animal oil, palm oil, palm kernel oil and coconut oil. 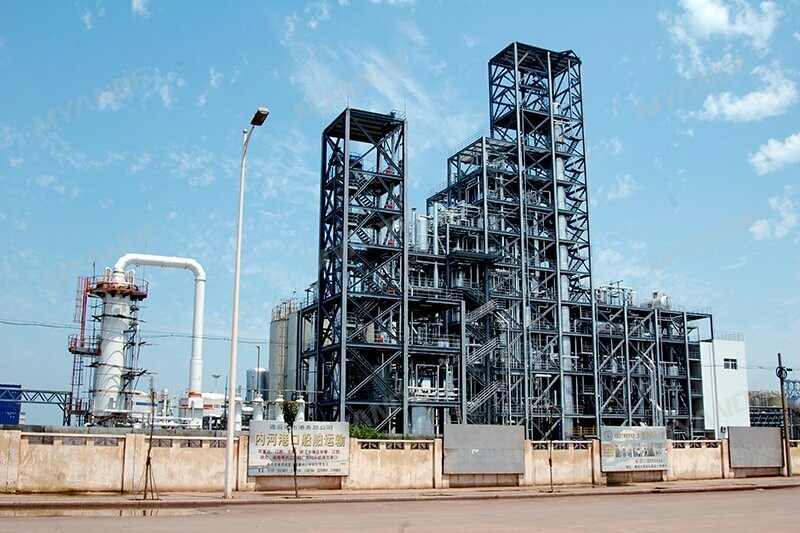 Main products include mixed fatty acid, crude oleic acid, crude linoleic acid, crude stearic acid, hydrogenated stearic acid, palmitic acid and etc. Pretreatment is designed to remove impurities. Whether pre-treat or not depends on the content of pectin, wax and other harmful substance except triacylglycerol when using vegetable oil as raw materials to produce fatty acids. Common pretreatment process includes hydration degumming and bleaching. Phospholipids can be removed by means of adding a small amount of phosphoric acid and the remaining impurities will be removed under the adsorption of bleaching carclazyte. Oil and hydrogen react at a certain pressure and temperature, in order to reduce the unsaturation of oil. The hydrogenated oil will yield more stable products in the further processing including catalyst filtration and avoid the fatty acids hydrogenation step. Adopting non-catalytic countercurrent hydrolysis at high pressure and temperature, oil splitting into fatty acid and glycerol. This method has the feature of high hydrolytic degree. Distillation is based on a packed tower where glycerine is distilled, fractionated to separate both heavy and light boiling impurities and condensed. Distillation tower is equipped with structured packing to fractionate heavy and light boiling impurities and to ensure that fatty acids are distilled at the lowest possible temperature. Condensation can be carried out inside tower over packing with cooling of an external pump around or outside the tower in shell and tubes condensers. According to different boiling points of different fatty acids at the same pressure, separate mixed fatty acids of different carbon chain to meet product demand. Fatty acids mixed with catalyst, entering into hydrogenation tower, then analyze the iodine value of product to determine whether the hydrogenation is completed.